Since I call my site and reports Dow Theory letters, I want to spout a bit of Dow Theory now. The power and usefulness of Dow Theory has been doubted and sneered at since the early 1900s, but the effectiveness of Dow Theory has been proven over and over again. Over the years, I’ve examined and followed countless new, improved market techniques and theories, and I’ve yet to see one that outdoes the Dow Theory over any extended period of time. In the end, what I trust most is the price action of the market. For those who follow the Dow Theory, I want to delve into one critical thesis. When a primary bull signal is given under Dow Theory, it means that the great primary trend of the market has turned up. The Dow Theory does not tell us how far up the market will go. It does not tell us how long the bull market will last. The Dow Theory does not tell us the path the market will take as the bull market develops. It simply tells us – The major trend is now up. I guess I’ve written this a few hundred times, but I’m going to say it again. The primary trend always runs to conclusion. The primary trend can be temporarily manipulated, it can be held back, it can be talked back, but ultimately, as night follows day, the primary trend will fully express itself. It will express itself whether it takes a year, or five years, a decade or more. Yesterday I read a piece by an analyst in which this analyst claimed that there is no such thing as a primary trend. I read the piece carefully, and my conclusion was that this analyst didn’t know what he was talking about. Let’s take a bull primary trend. A bull primary trend is seen when an item spends an extended period of time rising. Of course, in the course of the rise there will be many secondary corrections, but each correction will be followed by new highs. All true primary trends end in exhaustion. A primary bull trend ends when the last of the participants have “had enough” and take their profits. As a rule, bull primary movements end amid great excitement and intense speculation. This occurs as a greedy public rushes in to buy the market while at the same time the “smart money” moves out. This creates the state of exhaustion, since the buyers cannot absorb all the supply that is put up for sale. A bull primary trend ends when the best that can be seen ahead is fully discounted in the price structure. I should add that during a primary bull market the bull will attempt to rise while taking the fewest number of people with him. He does this with the help of multiple downside corrections. I developed my Primary Trend Index (PTI) in the late 1960’s and early ’70’s for the purpose of aiding me in identifying the major or primary trend of the market. My PTI is an amalgam of eight critical averages and indicators. Each indicator is based on the ACTION of the stock market (as opposed to sentiment indicators, monetary issues, etc.). 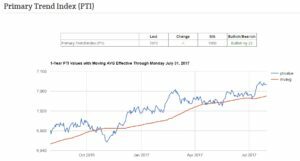 Thus, the PTI provides a special and unique technical picture which has been of great value to me and my subscribers over the years. During a strong bull movement the PTI will tend to push up day after day and week after week. Let me put it more simply. When the PTI is rising on a major trendline basis, the inference is that the market forces are bullishly advancing in harmony.